The blend of the most prestigious coffees and special roast give Kimbo Aroma Gold its perfect combination of rich aroma and full-bodied taste. Sold by the case. Twelve 8.5 oz (250 gr) cans per case. This is the finest espresso you will ever have. However, you will have to grind the beans a little finer to get the proper extraction in your machine. Then you will get a thick brownish-tan crema like you’ve never had before, even in Italy. 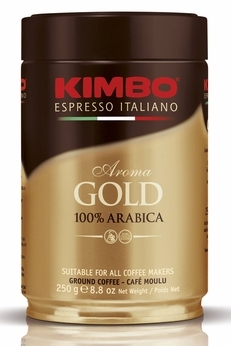 Been buying the Kimbo Gold for 10 years. Do not waste in a percolator. This is for real Espresso extraction only. I decided to try this in a drip coffee maker, thinking it would be a one time experiment. Ha, it was delicious and now I,m drinking big mugs of this liquid gold instead of tiny espressos. A perfect balance between flavor and aroma. I think this is really a superb blend of mainly Brazilian coffees. It has Arabica bean content which increases the richness of the brew.